This research proposal aims at developing a series of shaking-table tests on scaled models of groin vaults in different support conditions (springings either placed on fixed restraints or on typical supports like piers or walls) to analyse their behaviour under seismic excitation. Vaults represent a very common typology of roofing structural elements in monumental buildings and, in particular, in historical masonry churches. The damages observed after recent Italian and Spanish earthquakes pointed out that vaults are among the most vulnerable elements. Thus, the understanding of their dynamic and seismic behavior represents a crucial issue for the seismic vulnerability assessment of such structures. A vault under earthquake excitation is mainly subjected to two different phenomena: (i) response of the vault to differential horizontal displacement imposed at its springings by the excitation of the underlying structures (walls and piers), and (ii) dynamic response of the vault itself to acceleration imposed at its springings. The main objective of this project is to evaluate the crack pattern and the collapse mechanism of groin vaults with two different support conditions: on four fixed points and on two columns and a wall. The information to be gained from the effect of the supporting structure is fundamental to correctly plan seismic strengthening intervention projects in vaults and will be useful to the professional engineers. Experimental tests will be associated to numerical simulations, in both the design and the interpretation phases. The scaled vault will be designed and modelled not only by means of Finite Element Method (FEM), but also Distinct Element Method (DEM), using the commercial software 3DEC. 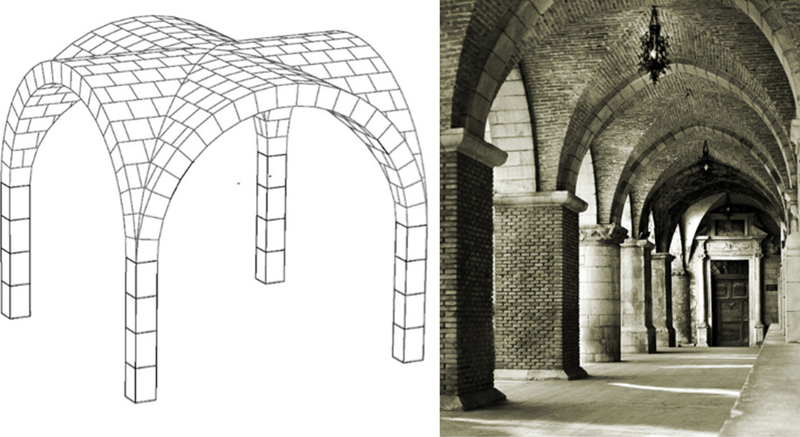 The scaled model of the groin vault will be designed as an assembly of distinct scaled “plastic-mortar” blocks: each block will be formed as a plastic skin (hollow section) and the inner core will be filled with mortar to acquire the corresponding mass for dynamic tests. The global geometry and the mass will be designed according to appropriate scaling methodologies (e.g., the Pi-Buckingham theorem). The formwork will be designed to allow the structure to be built and rebuilt after the tests at the lab facility without the need of specifically trained masons, minimising quality issues and time spent their technicians. The formwork and each scaled block of the model will be produced using a 3D printer. The advantage of this procedure is the repeatability of the tests, as the “plastic-mortar” blocks can be reused many times after each test to quickly rebuild the scaled model and carry out new -tests. In this way the effects of different support conditions and different directions of the horizontal seismic action with respect to the geometry of the groin vault will be assessed.